With all due respect to the legions of leaf peepers, there are specimens other than trees which can highlight your landscape with fall foliage color. Consider an ornamental deciduous shrub with sunny yellow leaves to brighten your autumn garden. Trees get all the attention in the fall foliage reports, but shrubs can bring autumnal accents to your landscape as well. I think yellow is the most in-demand fall foliage color of all, as many of us have already incorporated trees, bushes, and perennials with summer- and autumn-long displays of red or purple leaves. Let's lower our gaze from skyward to eye level and enjoy one of these fall-yellow shrubs in the home landscape. Autumn is an excellent time to plant shrubs and trees. Until the ground freezes, those woody plants can settle in and start rooting. In refining this list, I've looked for less-common shrubs of easy care and with charming attributes beyond fall color. All these listed are hardy in temperate zones, roughly 4 through 9, with witch hazel and summersweet being possibly the most chill tolerant. All are said to tolerate some shade while having the best foliage display with full sun. These are all deciduous, that is they will lose their leaves after the fall season and be bare during winter. Witch hazel can be counted on to provide gorgeous yellow fall foliage. The species virginiana is native to eastern North America. In the wild, it can form a large colony in forested areas. As you may guess from its forest origins, witch hazel will grow in shade. It enjoys a sunny location too, though, and will be at its showiest there. Witch hazel is a medium to large shrub. Keep it evenly moist to satisfy its shallow root system. After the leaves fall, witch hazel supplies a heartwarming, cold weather period of yellow from surprising winter bloooms along the stems. (Click here to view a magnificent full blooming witchhazel in Kentucky.) Several cultivars are available, some crossed with Asian species (intermedia). Click here for the Plantscout list of mail order sources for H. virginiana. 'Arnold Promise' is a popular yellow hybrid. Another native North American shrub, Sweetshrub is an old favorite for its highly fragrant, unusual reddish-brown flowers. The paired, oval leaves are fragrant too, and in fall turn a sunny yellow. Sweetshrub is tough , dependable in any soil and has virtually no pests. Like witch hazel, it can grow in some shade but will be prettiest with more sun. Sweetshrub growth is on the slow side as shrubs go, so it can easily be kept as a small to medium bush three to eight feet tall. In certain sites it may sucker vigorously. This bush has been a favorite pass-along plant through the years. Multiply or share this bush by potting up suckers and keeping them carefully watered. Suckers will grow to equally fragrant shrubs, whereas a seedling sweetshrub can lack the fragrance of its parent. 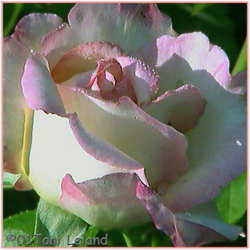 Click here for the Plantscout list of mailorder sources for "Bubby bush." Spicebush earns its name with lemony, peppery scented leaves and peppery berries. It's a cousin to Sweetshrub which also has aromatic foliage. Spicebush grows in woodlands from Maine to Florida and westward. You may have seen but not noticed spicebush in its nondescript summer garb. I include it here for the soft buttery yellow autumn leaves. In early spring, Lindera bloooms yellow (red or orange with selected cultivars) on bare branches. Between bloom and berries, the most striking feature on a Lindera could be one or more caterpillars of the Spicebush swallowtail butterfly. Berries turn red in late summer and are edible for man and beast. Plant Spicebush in any reasonable garden soil and light situation. It will grow in shade but needs some sun for the showiest growth and color. Lindera is medium to large shrub. Each Lindera has only male or female flower parts, so most retailers warn you that they cannot guarantee eventual berries on very young plants (berries develop on female plants only.) Click here for the Plantscout list of mailorder sources for Spicebush. Naturally found in boggy swampy understory, Summersweet also hails from eastern and central North America. Clethra grows as an upright suckering bush to about four feet tall. In midsummer, its sweet scented flowers can perfume a whole yard for weeks. 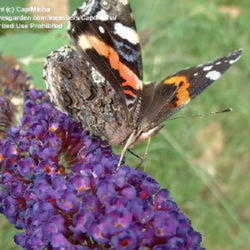 Butterflies and hummingbirds may enjoy the blossoms as much as the gardener. Fall foliage color is golden yellow. Water Clethra well in it first year or two if not planted in a naturally moist place, and then it will fend for itself quite nicely once settled in. Clethra can grow in your choice of sun or shade locations. Its favorite spot would be lightly shaded. Click here for the Plantscout list of mailorder sources for Summersweet. 'Ruby Spice' is a pink-flowering variety of Clethra. It seems that North America alone can saturate the yellow-fall-foliaged shrub market. Bottlebrush buckeye is native to woodlands in some warmer regions of eastern U. S. but will happily grow in much colder zones. This shrub has an airy branching style and large compound leaves. While it is a slow grower and won't surprise you by throwing branches across your path overnight, it does need a roomy location where it can reach its potential. The broad "mounded" looking bush will be topped with white flower spikes in summer. The large leaves turn yellow in fall, then drop to show smooth bare, barely branched stems. Be aware that the nuts are poisonous. If your chosen site is quite shaded, and can accomodate an eight to twelve foot wide bush, this would be the best of the four listed. There are no cultivar choices for this plant, only the straight species. Click here for the Plantscout list of mailorder sources for Bottlebrush buckeye. When choosing particular plants and cultivars, seek advice from a knowledgeable local grower. Check your selection specifically for autumn color, as certain cultivars of these plants may have been bred for fall foliage color other than yellow. Mature size may also vary among cultivars. And for heavens sake, watch those common names. Don't confuse your sweet shrub with your summersweet, for example. Take note of the italicized Latin names to be sure you get what you hoped for. If I've written this in time, you may be able to spot one of these beauties in a landscape near you. (And if you do see one, could you please contribute a photo to the Plantfiles?) Good luck shopping for your yellow-fall-leafed shrubs. 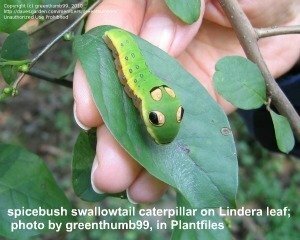 Thanks to DG subscriber greenthumb99 for fabulous image of the Spicebush swallowtail cat on the spicebush leaf.